The Seventies in German football history are dominated by discussion of the team that have won the 1972 European Championship and the 1974 World Cup. 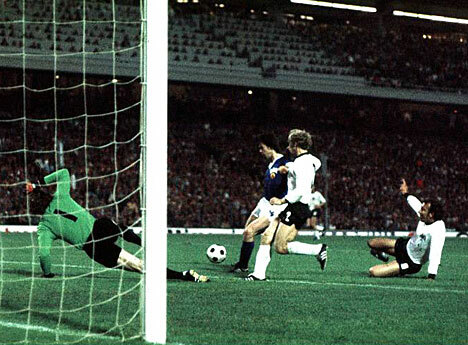 On course for their triumph against Holland, West Germany had to face East Germany for the one and only time. It was we against us. However, there was more to this decade than just that famous win in Hamburg on 22 June 1974. While the 1970s were and still are portrayed as the decade of total football played by the Dutch and West Germany winning the European Championship in 1972 and the World Cup two years later, East Germany experienced a decade that saw a European Cup triumph in 1974 as well as Olympic Gold two years after that. During this decade, the GDR produced arguably the best football in its 40 years of existence. The successful spell began at the Munich Olympic Games in 1972, which were overshadowed by an attack of members of the Palestine group Black September, during which 11 Israeli athletes, a German police officer and 5 attackers have been killed. It left the Games with a sour aftertaste and planted a feeling of insecurity among the Germans, who saw themselves confronted with the bloodiest decade in their post-war history. The football tournament in 1972 was a playground for Eastern European countries to shine as the medals went to Poland, Hungary and a shared bronze medal to the Soviet Union and East Germany. During the tournament the GDR beat their western compatriots in a team that featured Uli Hoeneß and Ottmar Hitzfeld as goal scorers for West Germany. The game finished 3-2 for East Germany in front of an 80000 crowd in a packed Olympic Stadium. While Hoeneß and Hitzfeld were the top stars in the West German team, the East Germans fielded a full strength side, underlining the importance of sport as an important tool to show case the socialist way of life a the superior one. Croy, Zapf, Pommerenke, Sparwasser, Streich, Kreische and ‘Black Peter’ Ducke are names that let the hearts of East German football afficionados beat faster. The year 1974 was arguably the biggest year for East German football. It all began with FC Magdeburg winning the East German Cup in 1973 against FC Lokomotive Leipzig. Their European Cup campaign kicked off with a 2-0 win on aggregate against the Dutch representatives NAC Breda, followed by a 3-2 win after extra time against Banik Ostrava. The quarterfinal saw the team of Heinz Krügel take on Bulgarian minnows Beroe Stara Sagora which they beat convincingly 3-1. Admittedly, these teams were not the créme de la créme of European football. The first real test came in the semi-final where Sporting Lisbon who had an equally simple task to get through the previous rounds by beating Cardiff City, Sunderland and FC Zurich. The other semi-final was played out between AC Milan and Borussia Mönchengladbach who have eliminated Dynamo Zagreb, Rapid Wien, PAOK Thessaloniki as well as Vestmannaeyja, Glasgow Rangers and Glentoran FC respectively. The final in Rotterdam was the biggest success East German football has to show off. The tiny crowd of 4600 is to date the lowest attendance for a European Cup Final. Many expected a final between Mönchengladbach and Milan and therefore the semi-final was considered the ‘real’ final. This however did not stop Magdeburg to play their natural game in an attack-minded 4-3-3 with Jürgen Sparwasser in the centre, Martin Hoffmann to his left and Detlef Raugust on the right. The final score was 2-0 and caused a collective outbreak of joy in East Germany. Jürgen Sparwasser was quoted once saying that if on his tombstone one wrote Hamburg, 22 June 1974 everybody would know who was buried there. At least everybody in Germany would surely know that, and more so in former East Germany. In their sole appearance at a World Cup the GDR were drawn with West Germany, Australia and Chile in Group A, more over, they even managed to win the group alas only to be drawn in a second group with Brazil, Argentina and Holland. We against Us was the subheading of this game later in history. It left the West Germans with a major task at hand to rescue their World Cup campaign about which there was no doubt that they had to win it, as it was played on home soil. As it turned out, losing to the GDR meant Helmut Schön’s team had an easier group to play in, avoiding the favourites. Just like in 1954 the West Germans were beaten in the group stages but turned out to be winners at the end. In 1954 Herberger’s men were at the receiving end of a 8-3 shellacking by Hungary, 20 years later it was the little neighbour who beat them. In the end the GDR finished a respectable third in their group behind Holland and Brazil but ahead of Argentina while the FRG topped their group after beating Poland, Sweden and Yugoslavia. Poland beat Brazil in the third place play-off, reaching their best result at a World Cup and underlining the strength of Eastern European teams in general at the time while the final of Munich has become part of Dutch-German football folklore. Only two years later East Germany won their only ‘major title’ at the Olympic Games in Canada. East Germany were in a group with Spain and Brazil (Nigeria withdrew) and managed a 0-0 draw with the South Americans before securing a quarterfinal place with a 1-0 win against Spain. The ‘Kaiser of East Germany’ Hans-Jürgen ‘Dixie’ Dörner being the scorer. To underline the strength of Eastern European football once more, the semi-finals of the Olympic football tournament were played out between the Soviet Union, Poland and the GDR, with Brazil the only ‘Western’ team. Once more Poland proved too much for Brazil, a brace by Szarmach secured a place in the final. That it was against the unfancied and not much liked East Germans added some spice to the contest. That however, was soon over as Schade and Hofmann scored within the opening 15 minutes, Lato scored after an hour but Häfner restored to 2 goal lead after 84 minutes. It was the only trophy for East Germany. In Moscow four years later Czechoslovakia beat the East Germans in the final 1-0 while for the Seoul Games they failed to qualify. 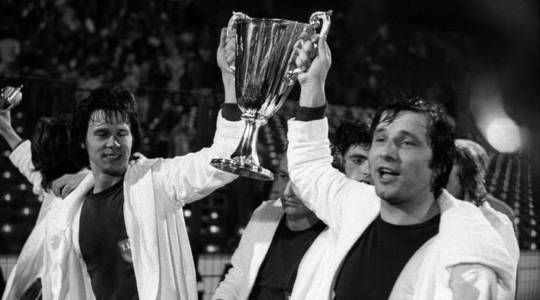 The decade of footballing success came to an end in 1981 when Carl Zeiss Jena lost their Cup Winners’ Cup Final against Dynamo Tiflis 2-1 with the winning goal coming as late as the 86th. minute. It was 7 years later when another team reached the final of the competition again. Lok Leipzig played Ajax Amsterdam and a young Marco van Basten scored the winner for the Dutch. A youngster with the name Denis Bergkamp was also substituted after an hour by manager Johan Cruyff. Of course, it was not all about FC Magdeburg and the national team. In the 1972 BFC Dynamo made it to the semi-final of the Cup Winners’ Cup but were beaten by Dynamo Moscow. Ironically, Bayern Munich also lost. It would have been an interesting all-German final. The same year that saw Magdeburg beat Milan in their biggest moment, Lok Leipzig reached the semis of the UEFA Cup, only to lose to Spurs. Throughout the decade Dynamo Dresden and FC Magdeburg dominated the league, winning 3 and four titles respectively. On the European stage they were joined by Lok Leipzig and Carl Zeiss Jena. The 1980s saw the slow decline of East German football. The league was dominated by BFC Dynamo who were favoured by Stasi head Erich Mielke and rumours of heavily influenced referees were wide spread even then. It was Dynamo Dresden with a young team consisting of Matthias Sammer, Ulf Kirsten, Torsten Gütschow and Frank Lieberam who ended Berlin’s dominance in 1989. They repeated the feat in 1990, winning the double. Memories of the ‘golden 70s’ were already distant then and have become oral history in East Germany. “We vs. Us” — what a great way to put it Christoph. I remember Sparwasser from a Panini album and Magdeburg from when they played my Juve in the quarters of the 76-77 UEFA Cup (watch: http://www.youtube.com/watch?v=_lbaZLd3f-g). Going back to “We vs. Us”– has something like this happened in Cyprus? Ireland (Eire vs. No. Ireland) offers a fascinating comparison as well. Thanks for all you do.